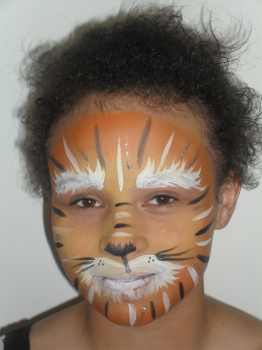 The coolest tiger face painting ideas are here for you to look at also get some free face painting ideas. I'm sure I don't have to tell you how much FUN kids have with these kind of toddler activities. 1. 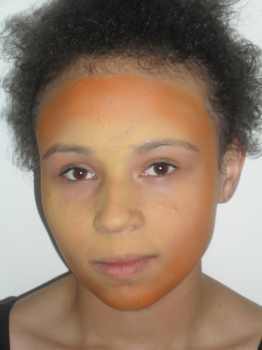 Start with apply orange paint to the outside of the face with a sponge. Then apply yellow paint to the center of the face using a sponge again. Now blend the edges where the two colors meet. 2. Next using a medium brush and white paint create the bushy eyebrows. Now using the white paint again create the muzzle around the mouth. Also paint the lips white. 3. Now using cream paint add just a few extra lines to the eyebrows. Using the cream again create the cream shapes over the top lip. Then add the black whisker spots. 3. Now keeping with the black paint to color the end and under the nose. Also a line to connect the nose to the top lip. Then create 3 little whiskers on each cheek starting at the edges of the mouth. 4. Finally for the tiger stripes all around the face. Start with the nose then continuing around the edges of the face. Use white, cream and black paint for the stripes and do light and dark stripes intermittently. You can print of a tiger face painting template here as a pdf. It saves having to print the whole of this webpage. If your looking for more face painting ideas then this video below shows you how to face paint a tiger.